I have recently started a new job working for Greyhound Australia as their Online Marketing Coordinator. Understandably, as a part of my first week, I needed to spend sometime with the IT department, to get a better idea of how things work and what systems they have in place. The IT department is in Toowoomba. With a ticket for a Greyhound bus I was off that morning to the Roma street Transit Centre. 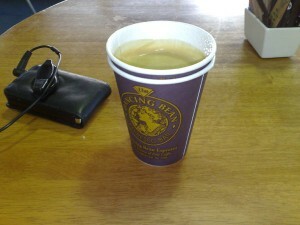 There are not a lot of cafes in the Transit centre, but there was one called the Dancing Bean. The coffee was not too bad, and they had an extensive range of cakes. I did not see the coffee beans that they used, but the coffee was not bad. It kept me going for most of the day until I was taken to this small cafe in Toowoomba called Coffee, Tea and Me.